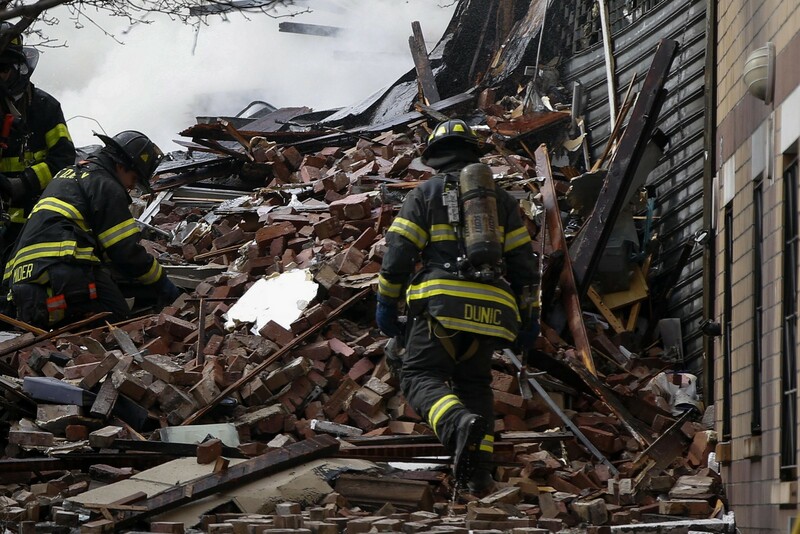 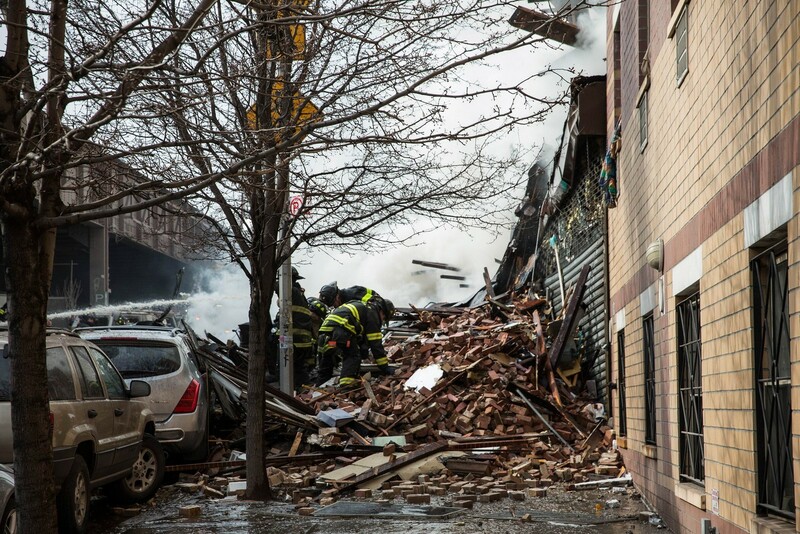 NEW YORK - Two women were killed in a building collapse in Upper Manhattan on Wednesday, New York City Police said. 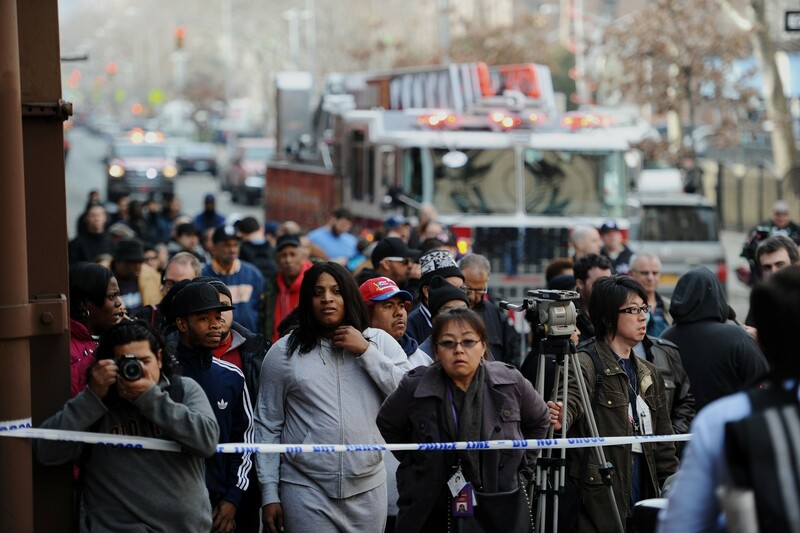 "Two people are dead, both females," said police spokesman Martin Speechley. 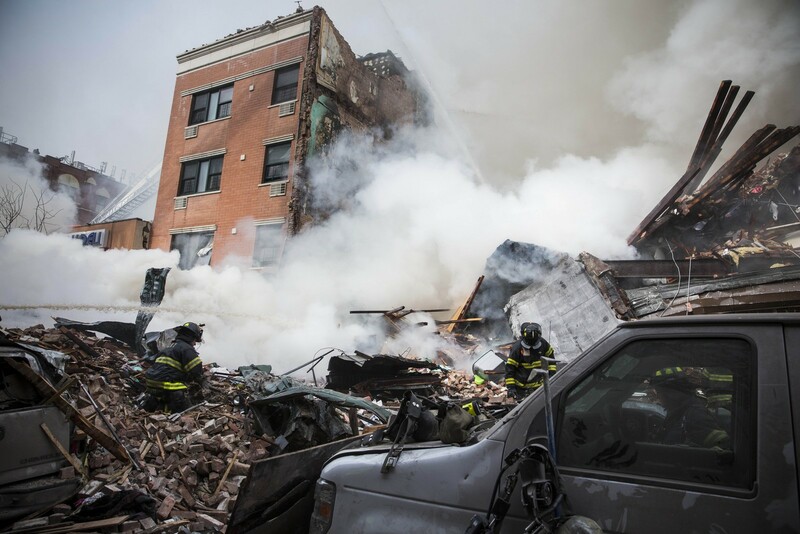 Two buildings collapsed in an explosion in Upper Manhattan on Wednesday, killing two, injuring at least 17 and setting off a search for anyone trapped in the debris, witnesses and officials said. 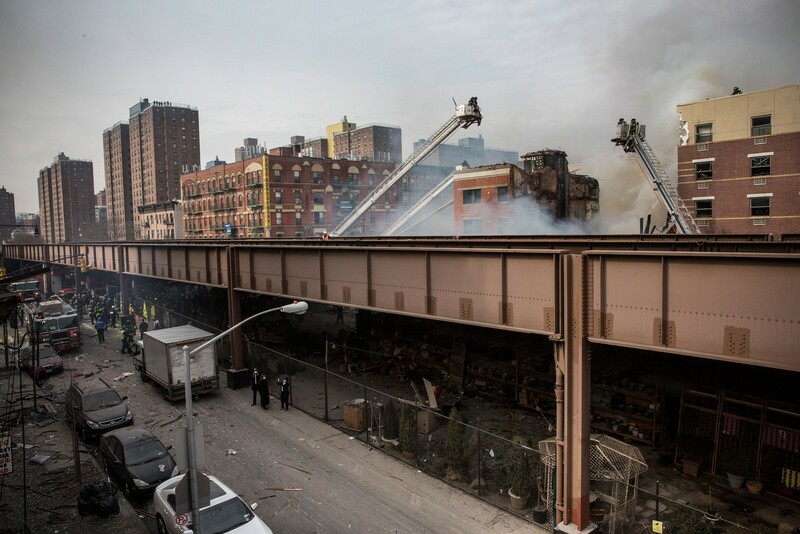 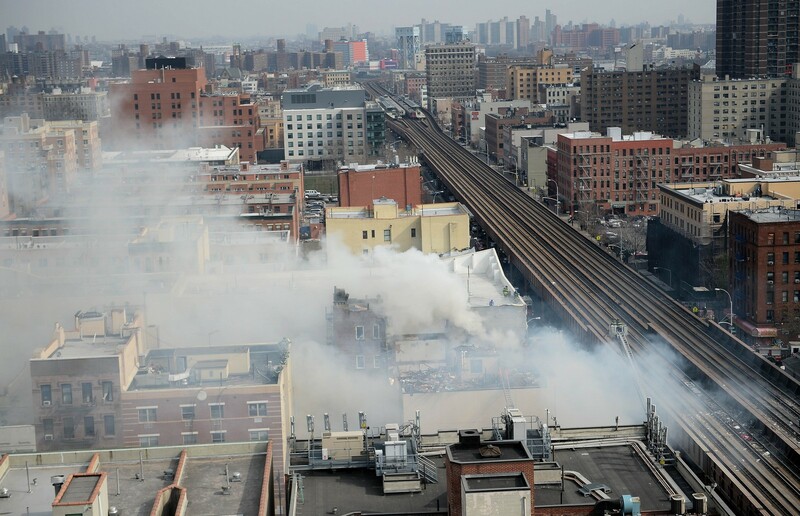 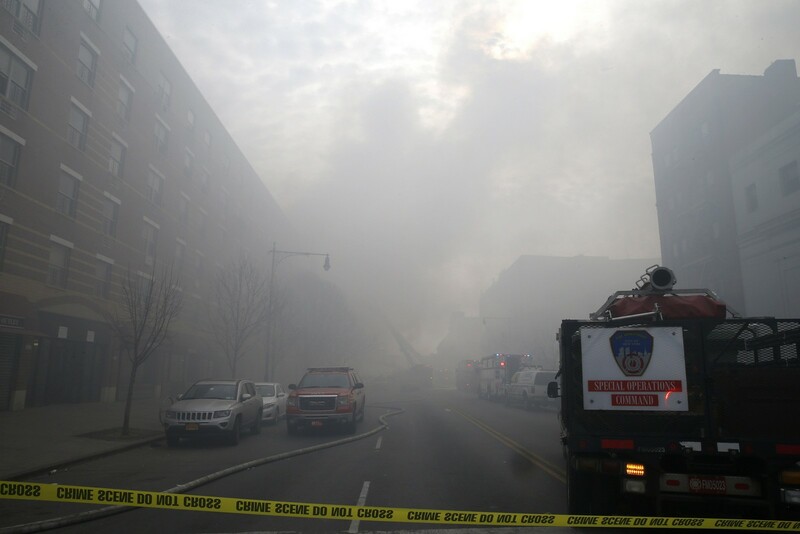 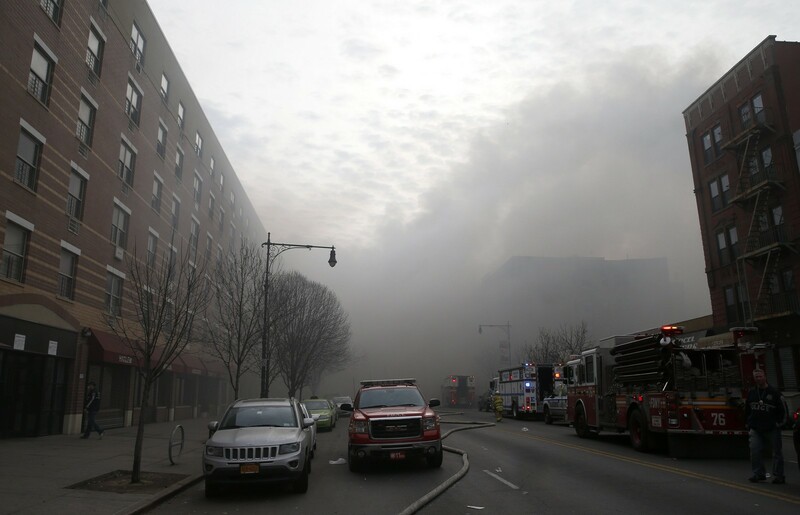 Massive clouds of smoke billowed from the charred rubble of the adjacent five-story structures which reportedly collapsed shortly after 9 a.m. (1300 GMT)on the largely residential block at East 116th Street and Park Avenue in East Harlem. 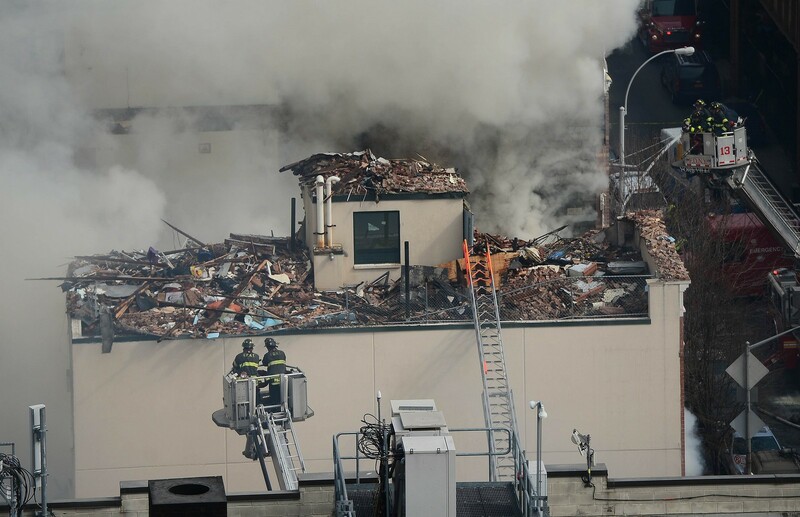 Residents said the fiery collapse of the apartment buildings atop ground-level businesses - a church and a piano store - was accompanied by a loud boom that could be heard from blocks away and shattered windows around the neighborhood. 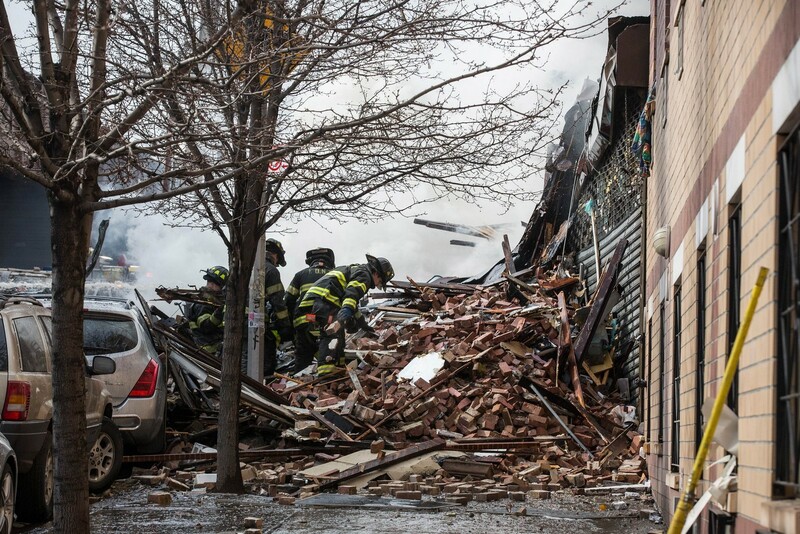 "All of the sudden the whole building shook. 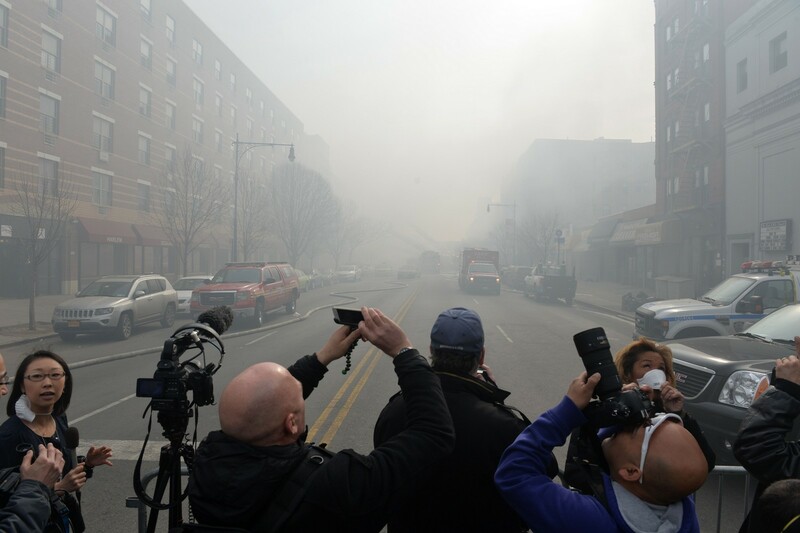 We had no idea what was going on," said Robert Pauline, 56, a Columbia University data processor whose apartment six blocks away was rocked by the explosion. 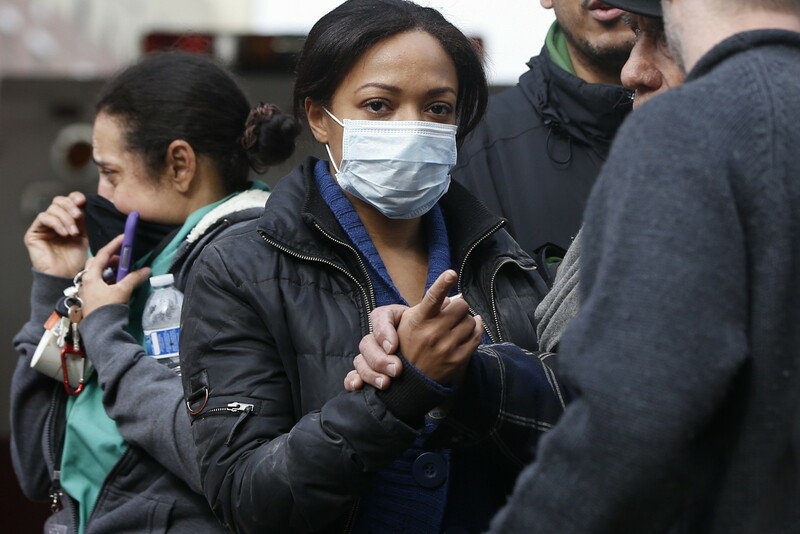 Another nearby resident, Chasity Bergos, 23, said she received worried calls from friends who "woke up thinking it was an earthquake." 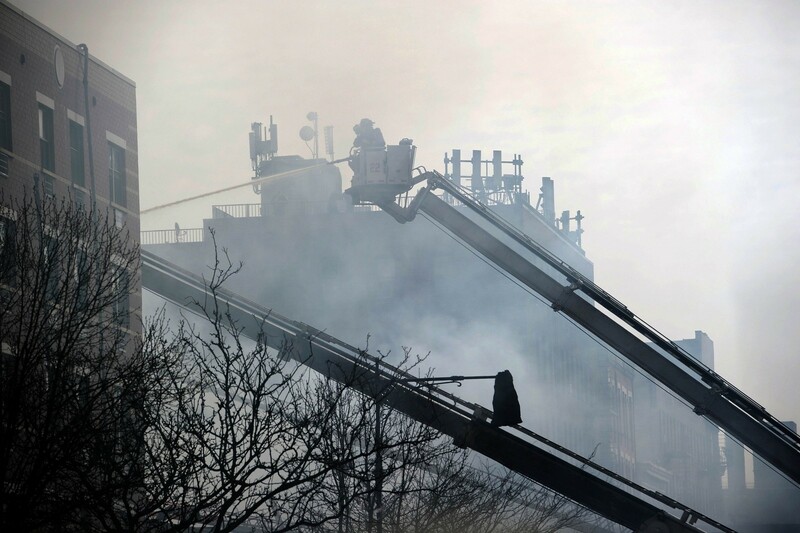 Police spokesman Martin Speechley said the cause of the explosion was under investigation. 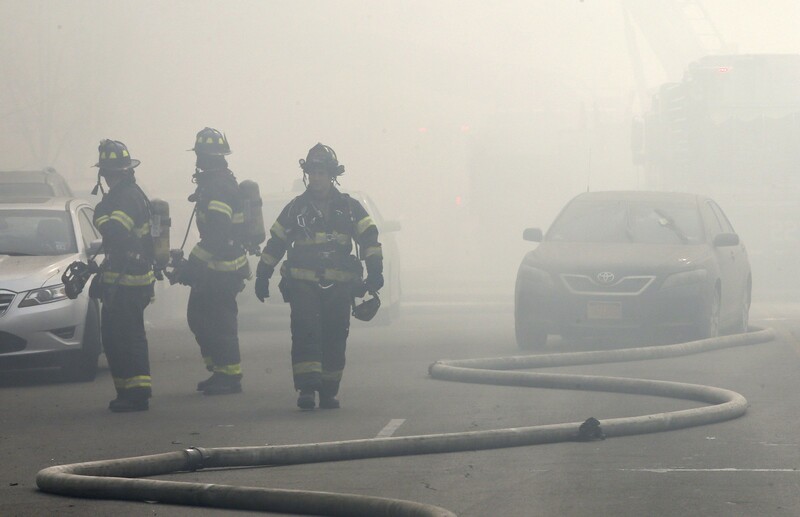 Mayor Bill de Blasio rushed to the scene, where a cascade of twisted and burnt metal blocked the sidewalk and covered parked cars. 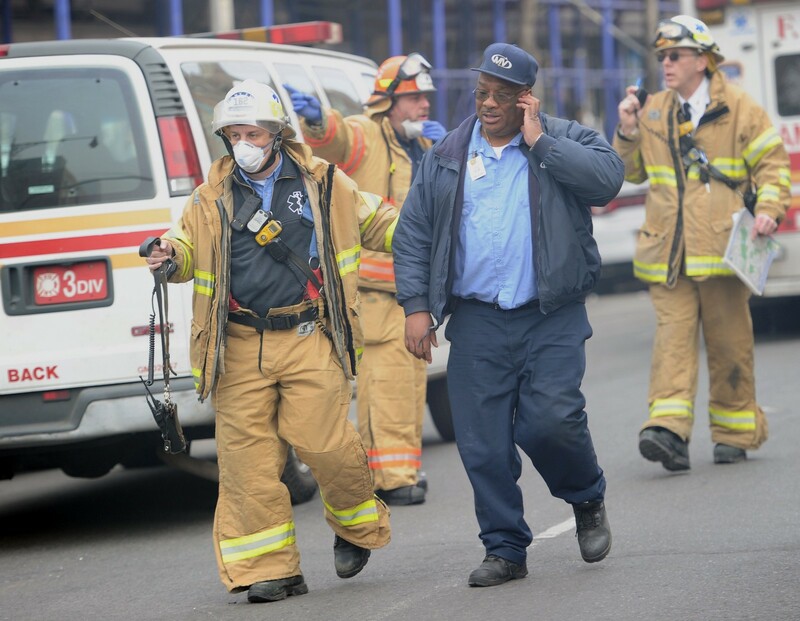 President Barack Obama was briefed on the collapse and sent his condolences to the victim families and his support to first responders at the scene. 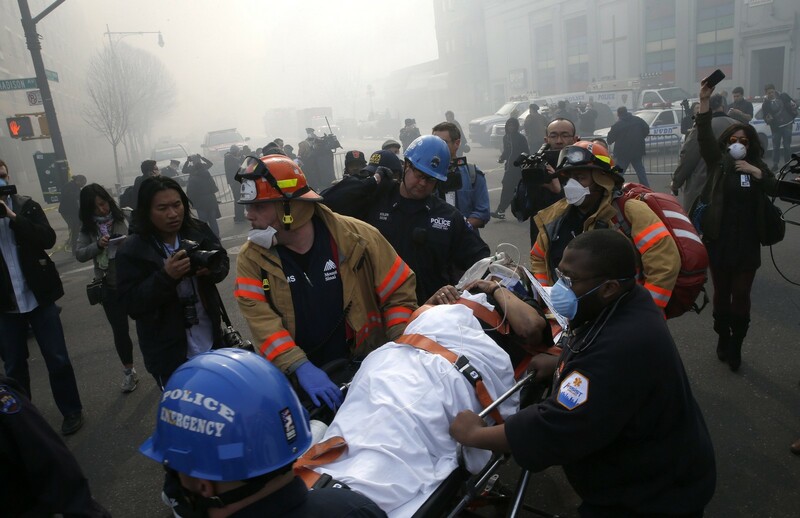 "Our thoughts and prayers go out to everyone impacted by this incident," the White House said in a statement. 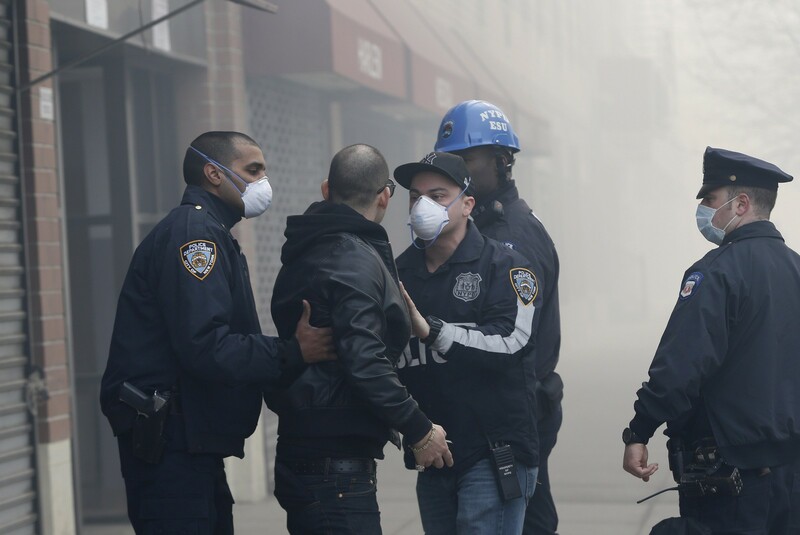 Crowds of residents, their faces covered with protective scarves and masks, filled the sidewalks of surrounding streets, which were blocked off with yellow police tape. 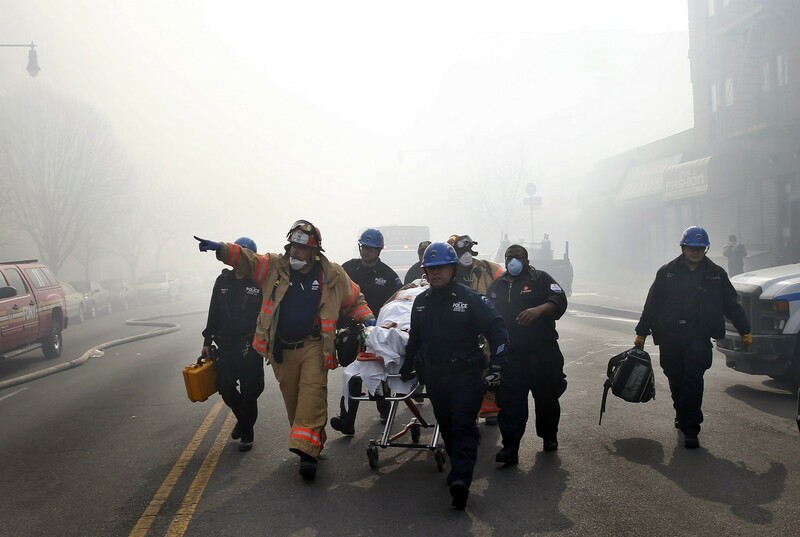 "It's a very active scene. 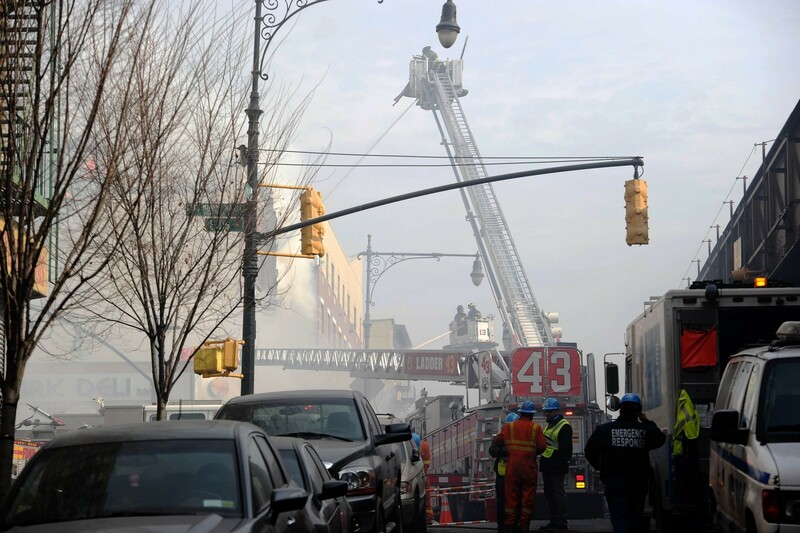 It's a very chaotic scene," said Fire Department spokesman Michael Parrella. 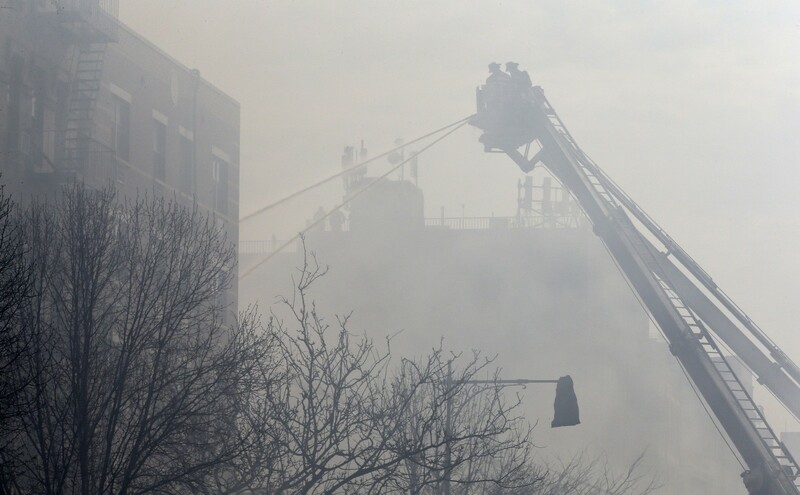 Fire trucks used high cranes to spray blasts of water into the rubble, as dozens of ambulances and police cruisers with flashing lights swarmed the scene. 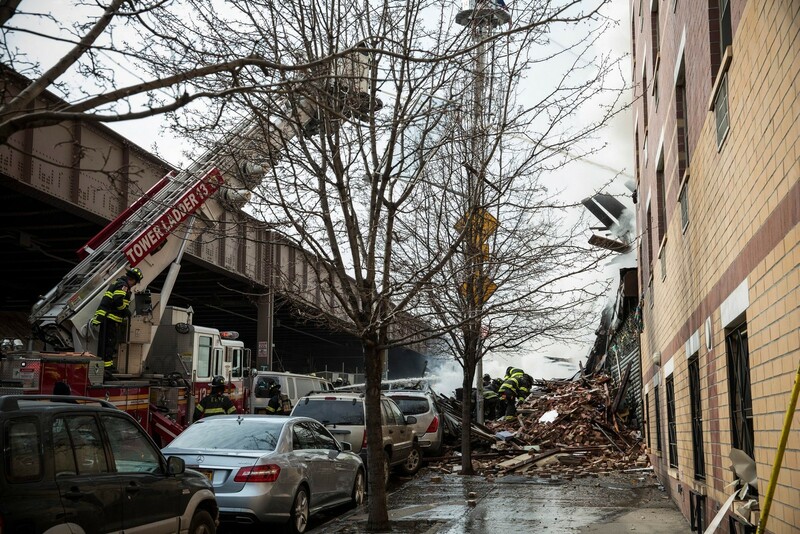 Commuter trains were stopped on nearby tracks because of the debris on the rails and passengers were ordered off the Metro-North Railroad cars at the Fordham stop in the Bronx, passengers said. 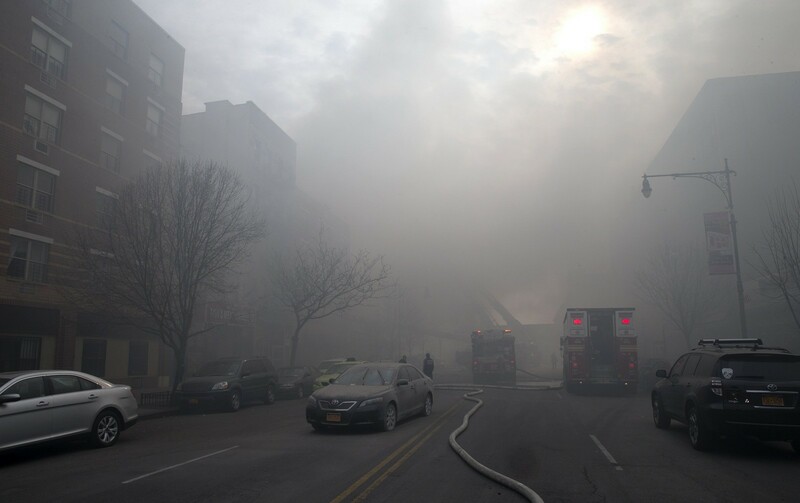 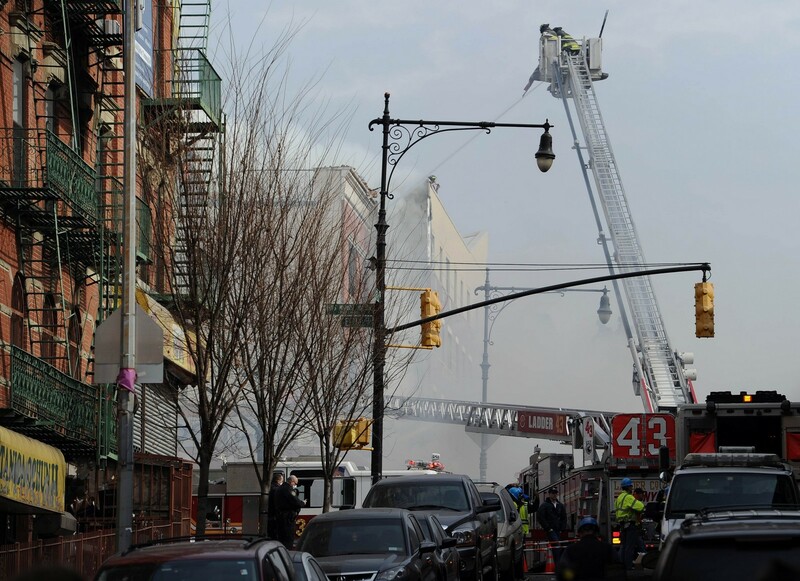 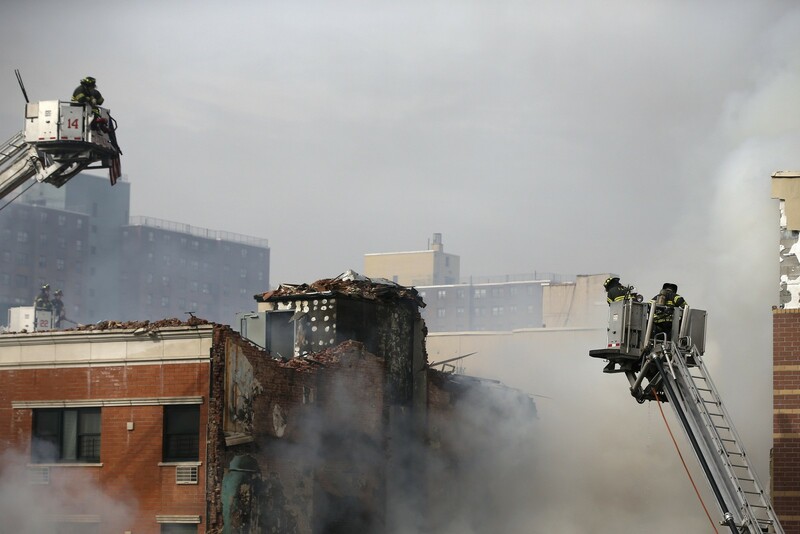 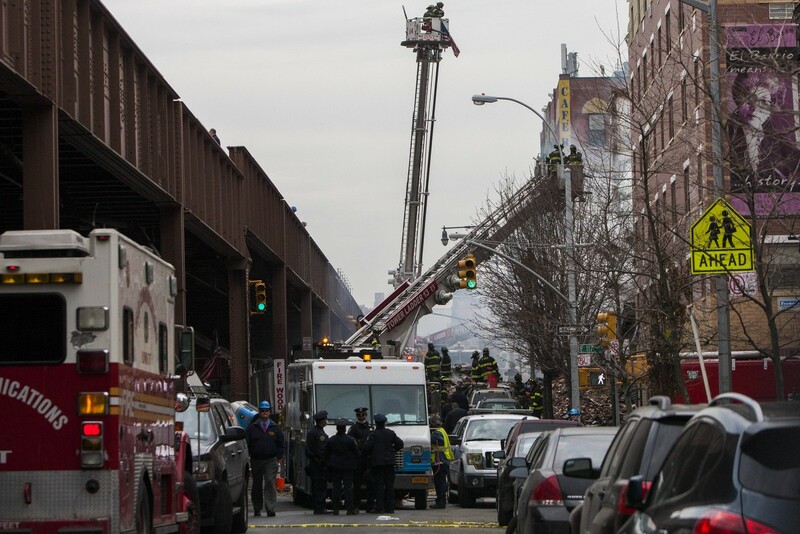 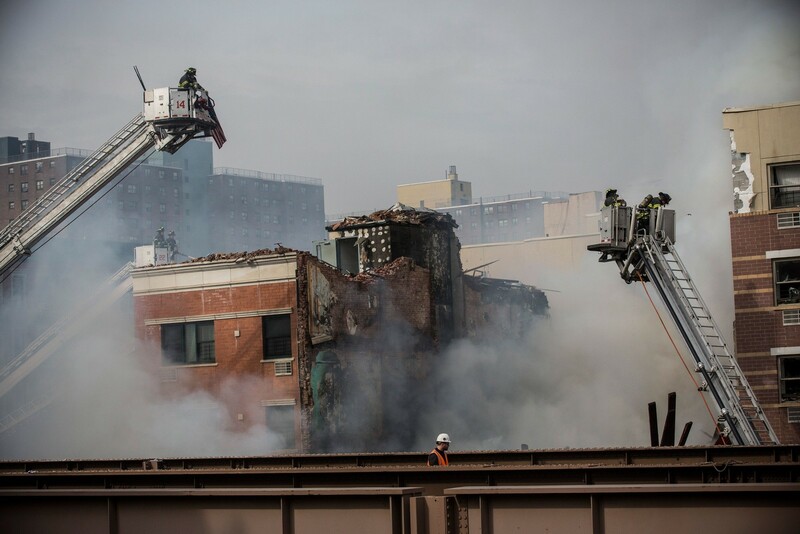 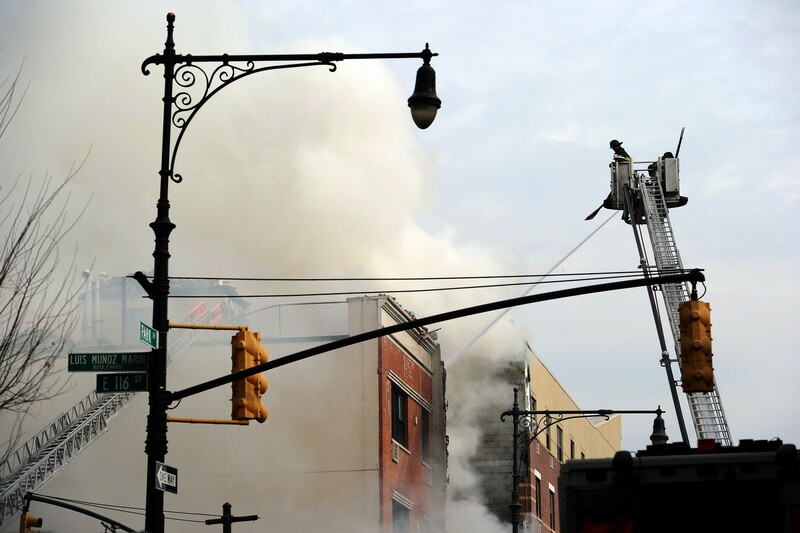 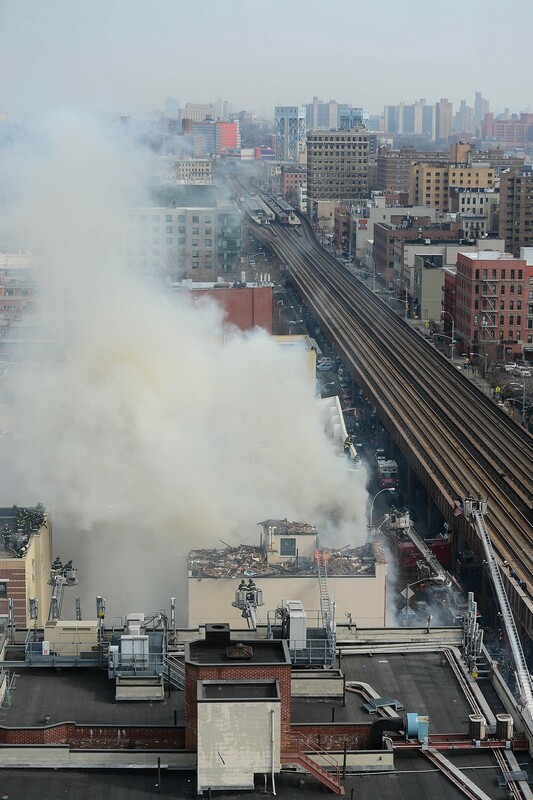 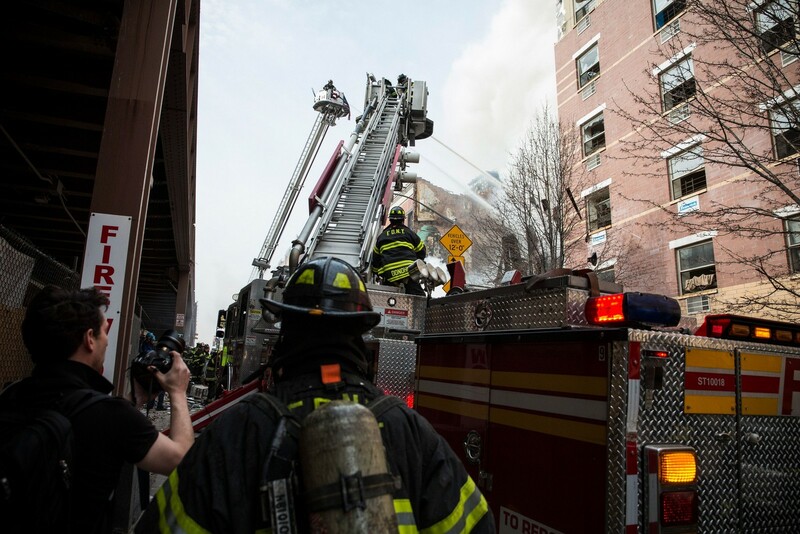 New York firefighters said they are battling a massive blaze in East Harlem on Park Avenue after multiple buildings collapsed following an explosion reported shortly after 9am on Wednesday. 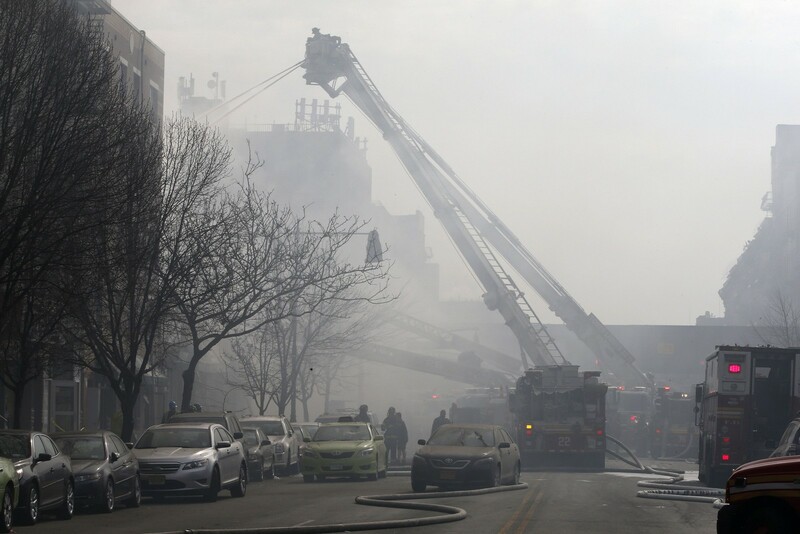 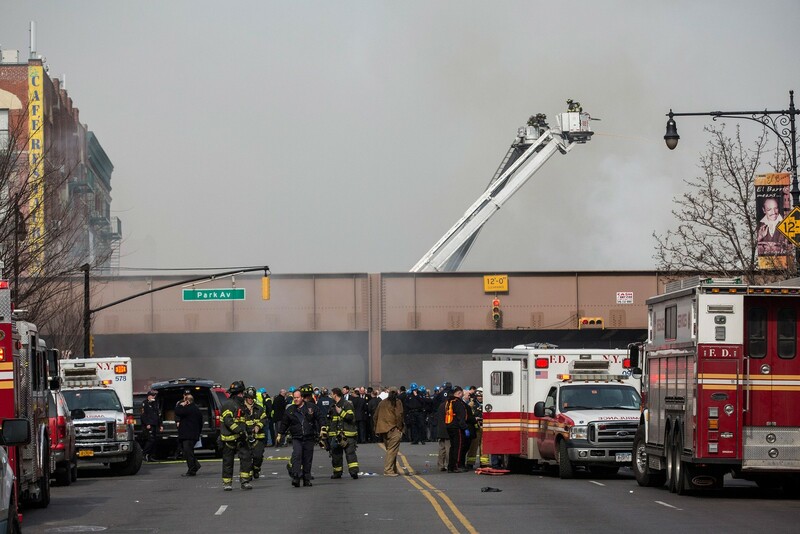 At least one person had been killed and 17 people injured, said the fire department, adding that it has sent 39 units of equipment and 168 firefighters to the area to fight the five-alarm fire. 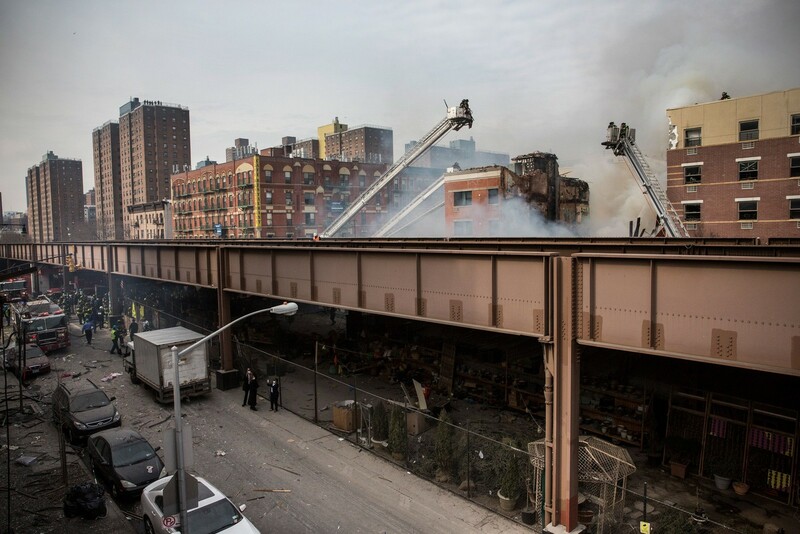 "It’s a very active scene. 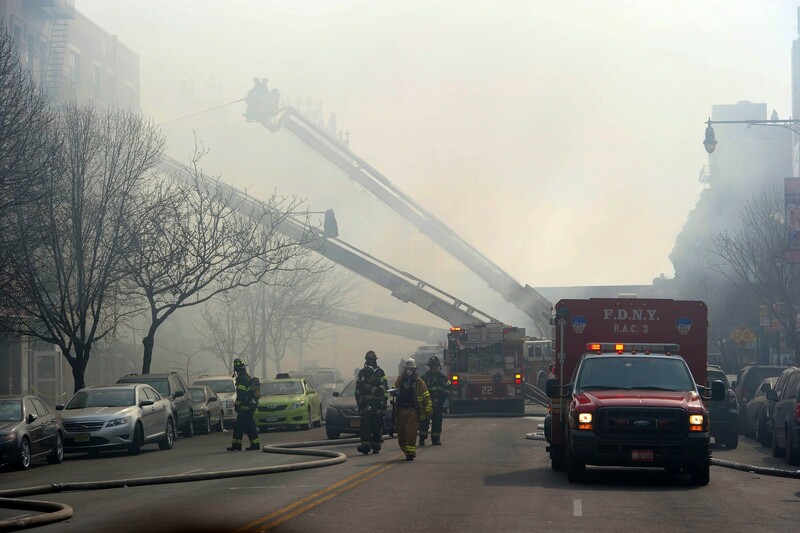 It's a very chaotic scene," said Fire Department spokesman Michael Parrella. 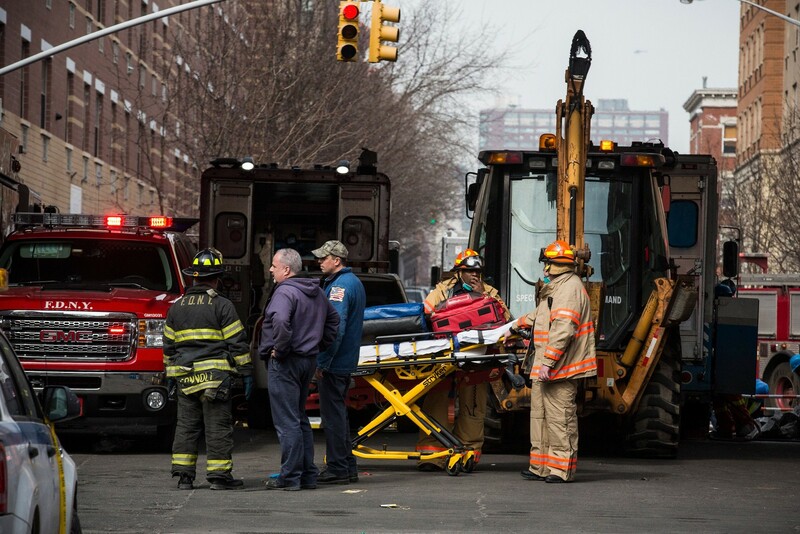 The blast, reported about 9.30am, was at 1644-66 Park Avenue, another Fire Department spokeswoman Elisheva Zakheim told Bloomberg. 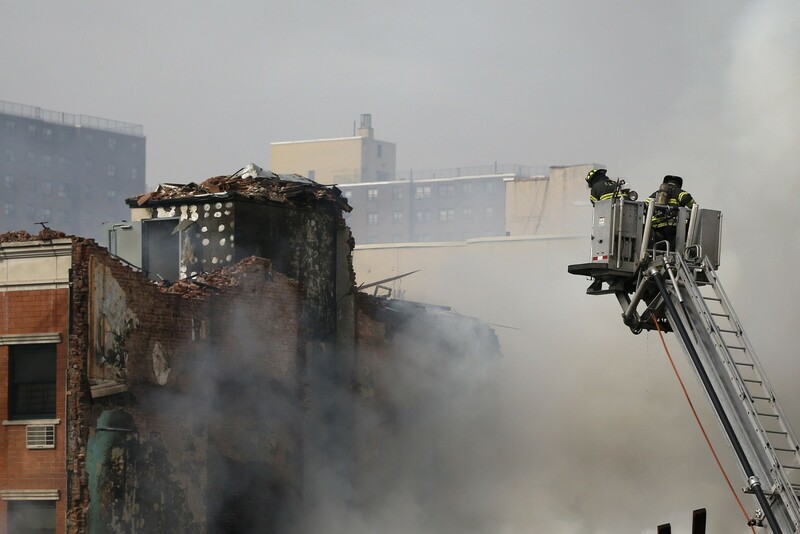 It is unclear how many people were in the collapsed buildings but the authorities said they were responding to reports of people trapped in the rubble. 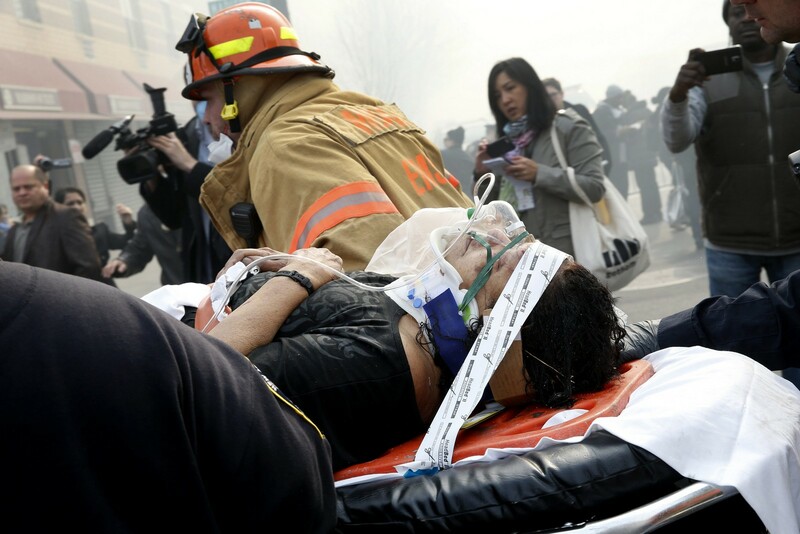 Paramedics have also arrived at the scene, according to local news videos. 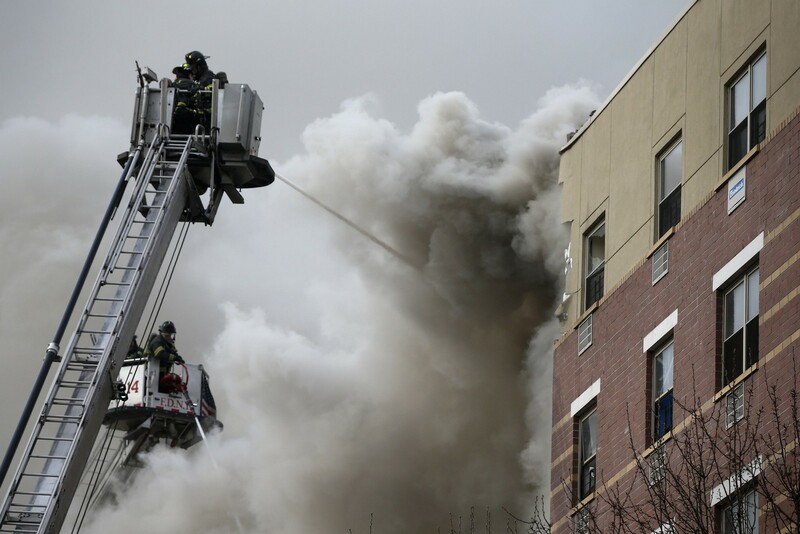 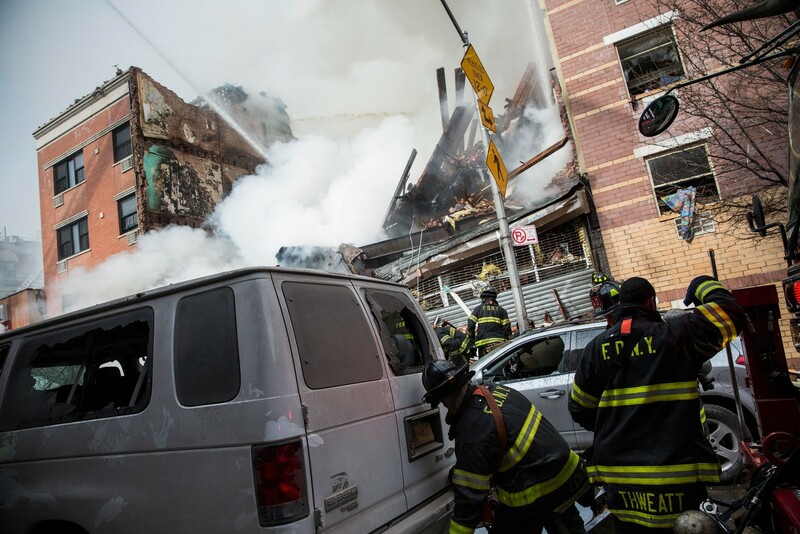 Firefighters from the Fire Department of New York (FDNY) respond to a 5-alarm fire and building collapse at 1646 Park Ave in the Harlem neighborhood of Manhattan March 12, 2014 in New York City. 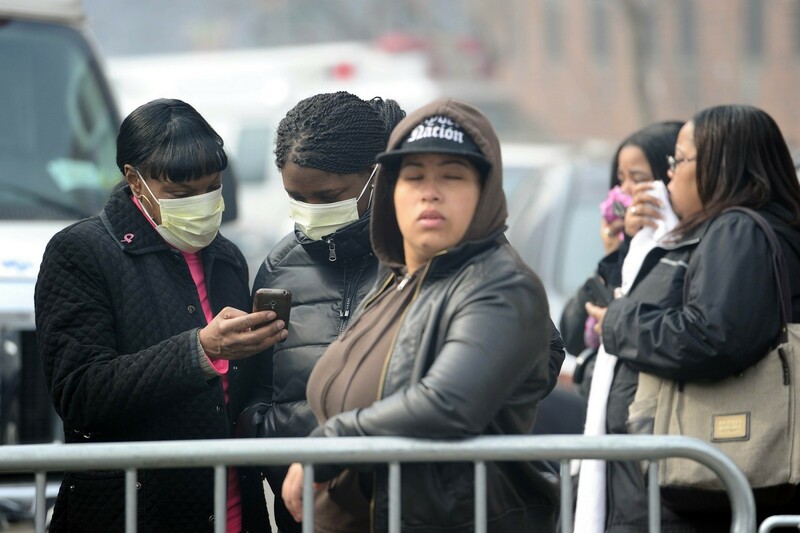 Residents wearing face masks comfort each other at the site of a building collapse in Harlem, New York March 12, 2014. 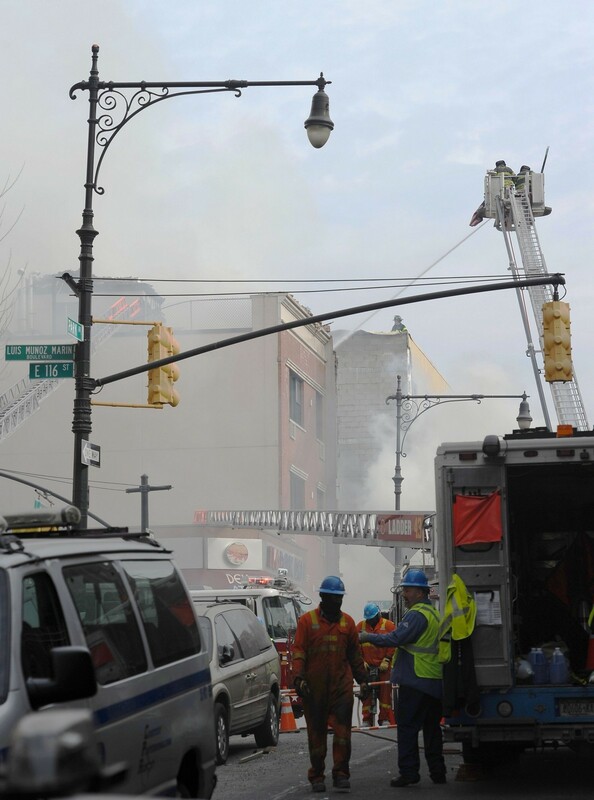 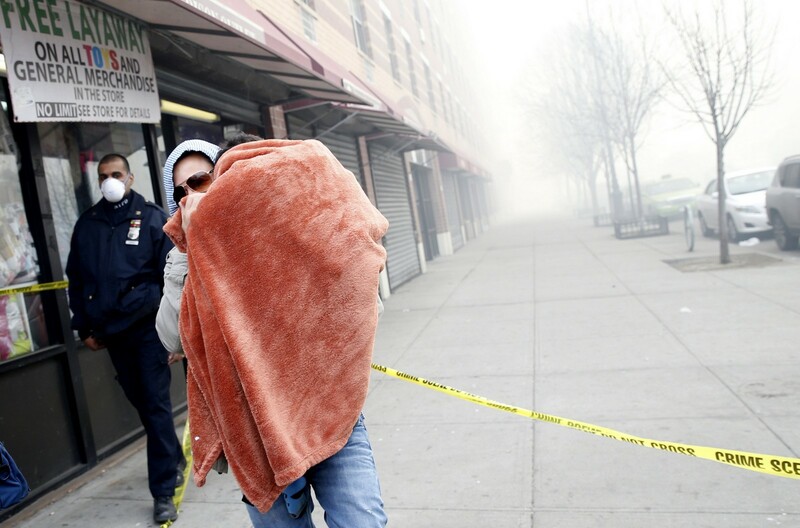 A victim is evacuated by emergency personal near an apparent building explosion fire and collapse in the Harlem section of New York City, March 12, 2014. 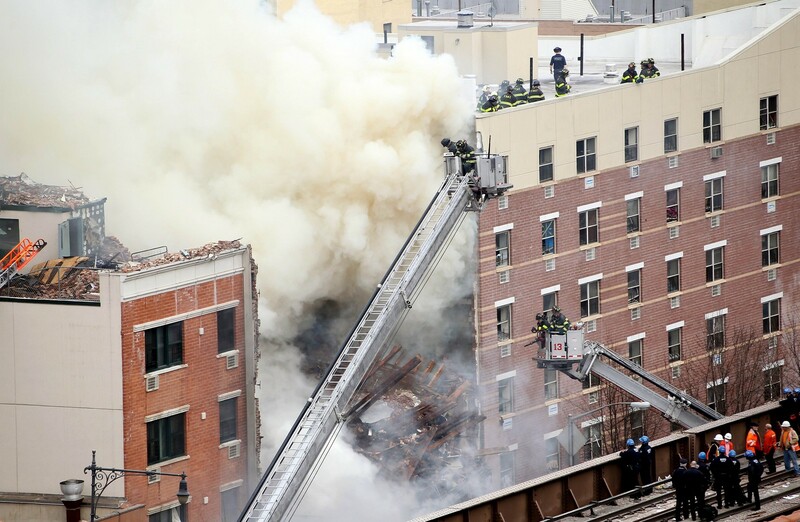 New York City Fire Department firefighters at the scene of an explosion and building collapse at Park Avenue and East 116th Street March 12, 2014 in the Harlem section of New York. 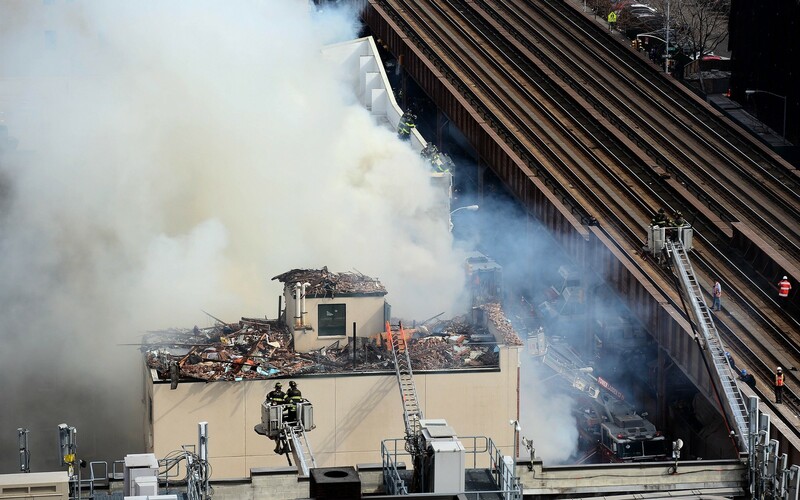 The Metropolitan Transportation Authority announced it had suspended all train services in and out of Grand Central Terminal until further notice due to the explosion next to its tracks. 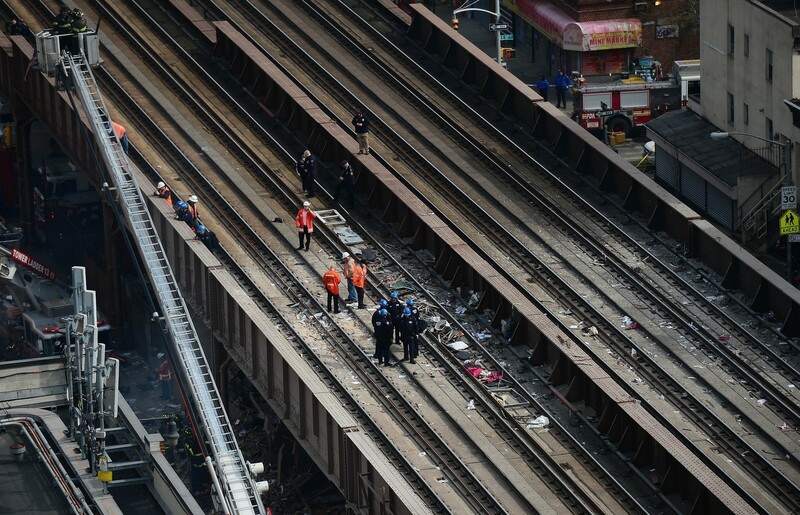 "It was complete shock," one young woman told WNBC. 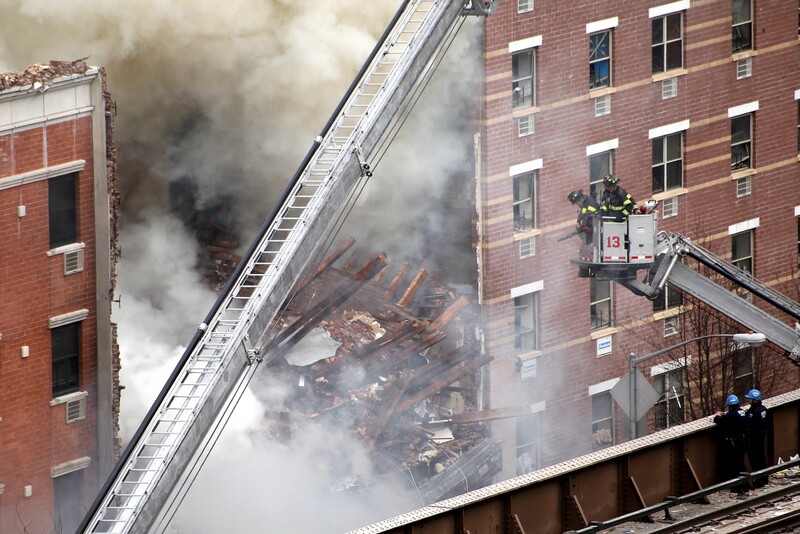 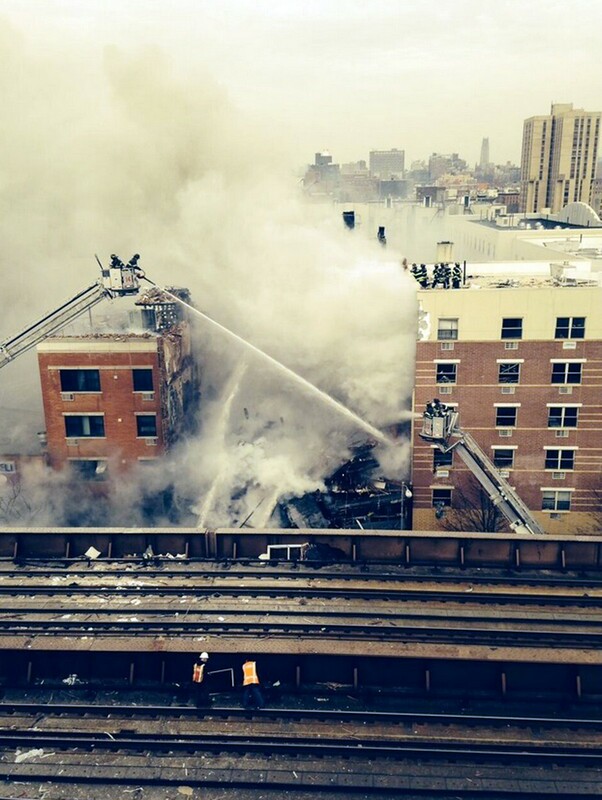 "It shook my building so hard that I literally thought my building was falling down." 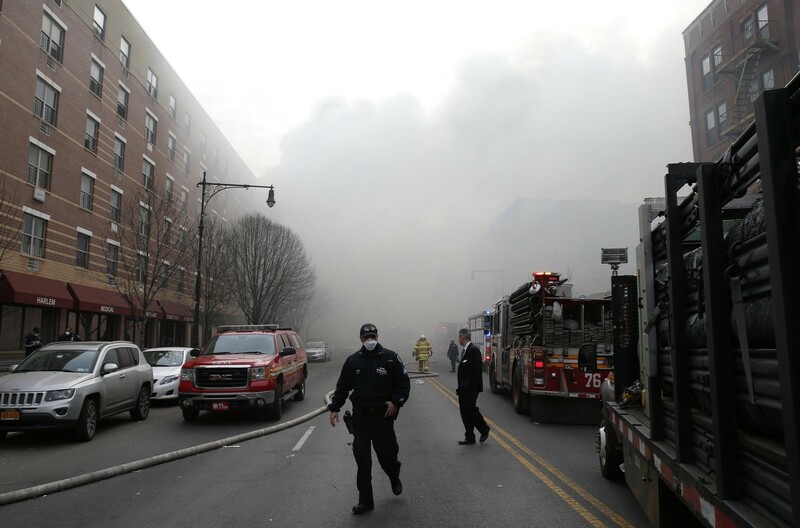 The woman, who lives around four buildings away, said that right after the explosion, people began running, unsure of what was happening. 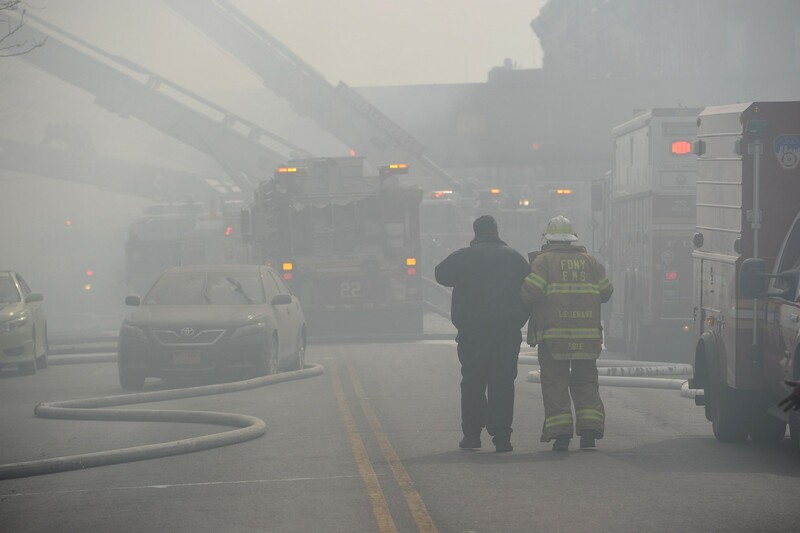 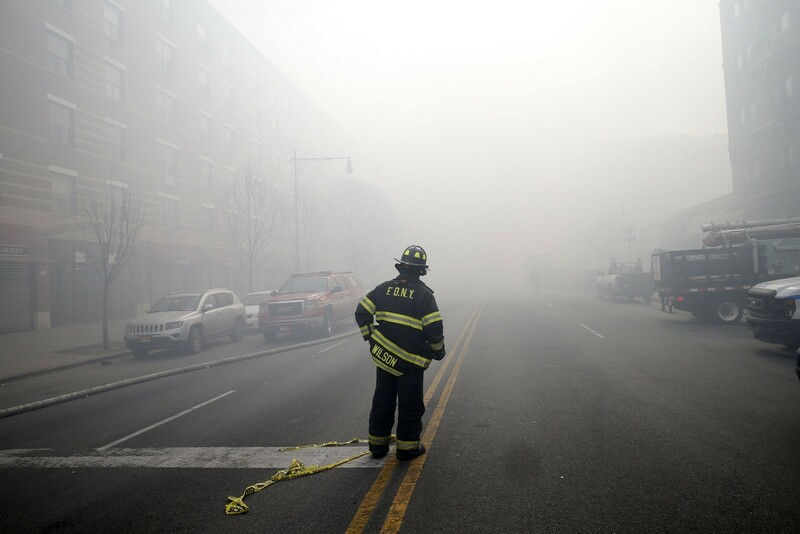 Two firefighters from the Fire Department of New York (FDNY) walk on scene as they respond to a 5-alarm fire and building collapse at 1646 Park Ave in the Harlem neighborhood of Manhattan March 12, 2014 in New York City. 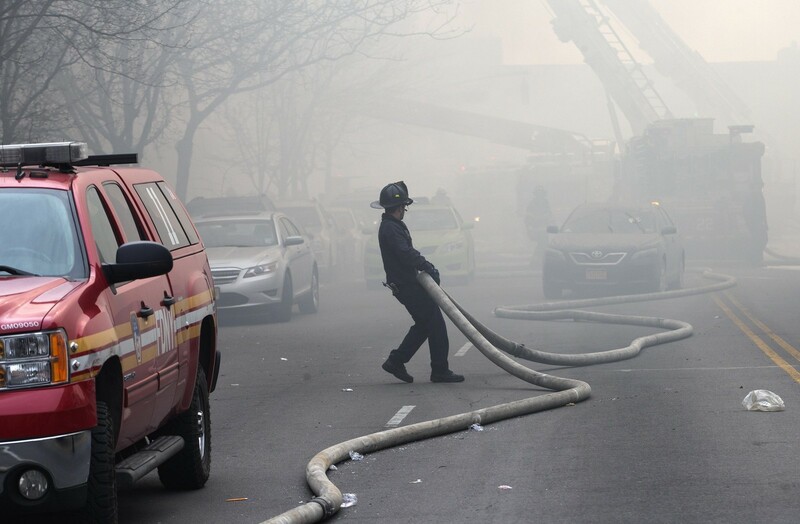 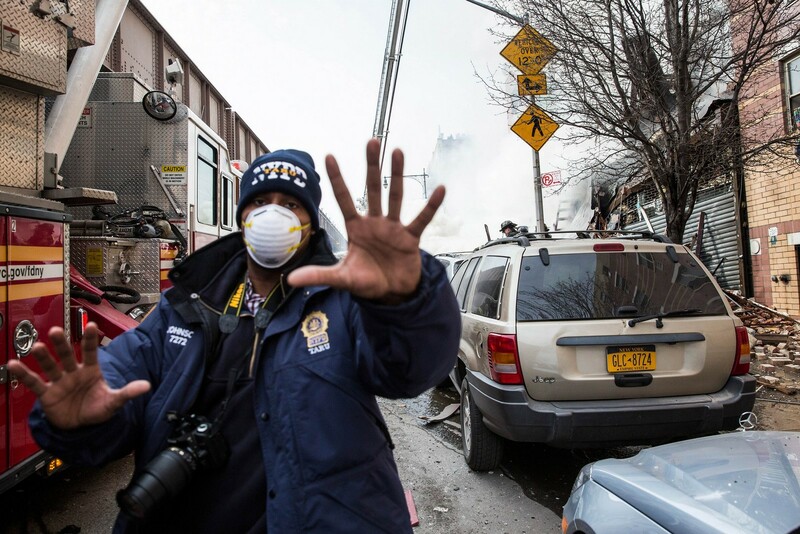 A member of the New York Police Department (NYPD) gestures as as emergency personnel respond to a 5-alarm fire and building collapse at 1646 Park Ave in the Harlem neighborhood of Manhattan March 12, 2014 in New York City. 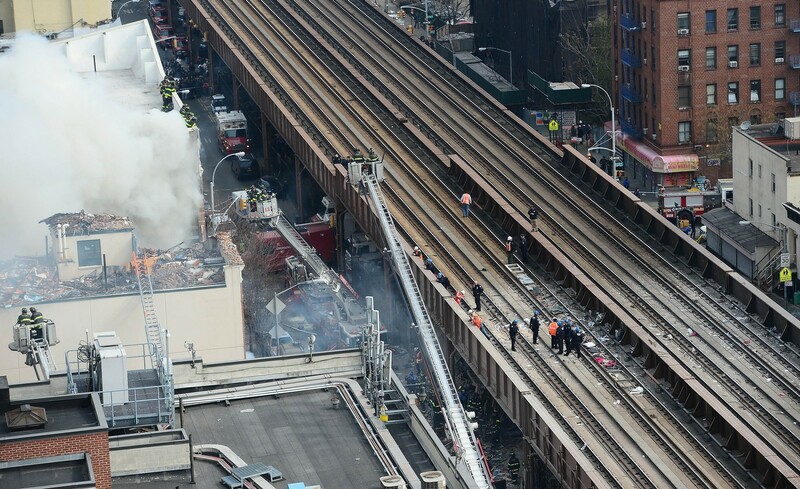 Details are only beginning to emerge. 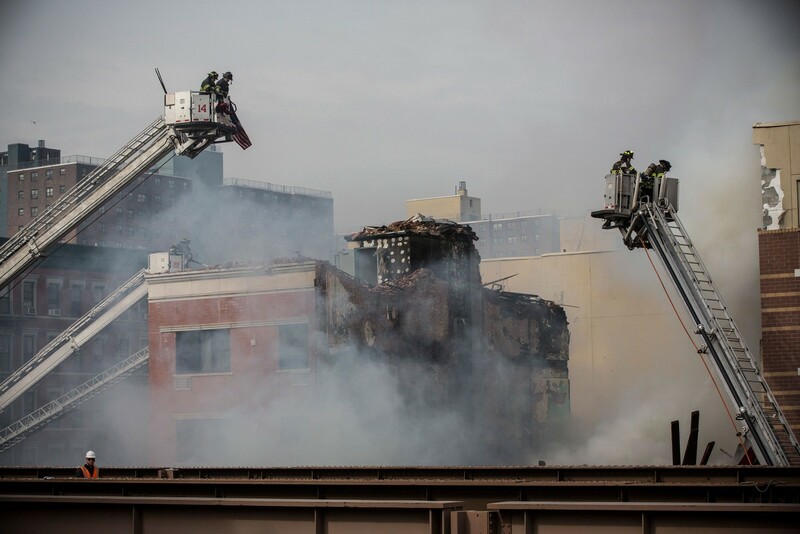 "It looked like something fell because it wasn't like a fire. 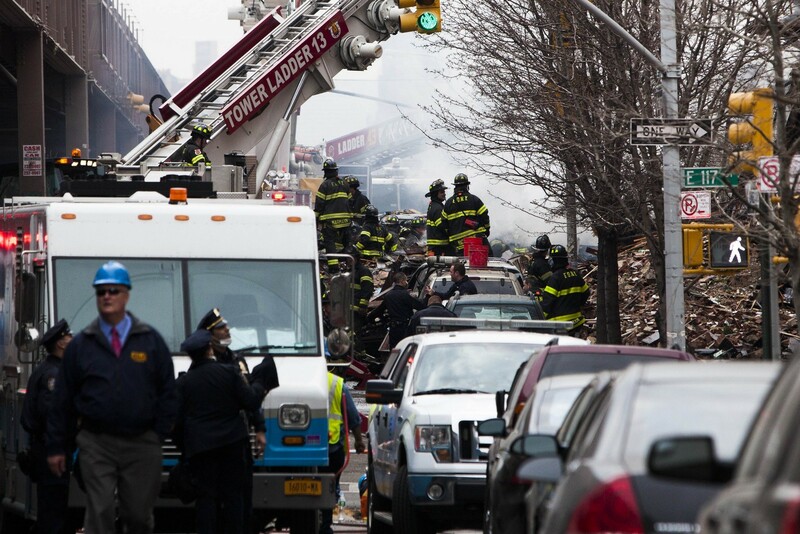 It just looked like debris smoke, similar to 9/11," a nearby resident told CBS News. 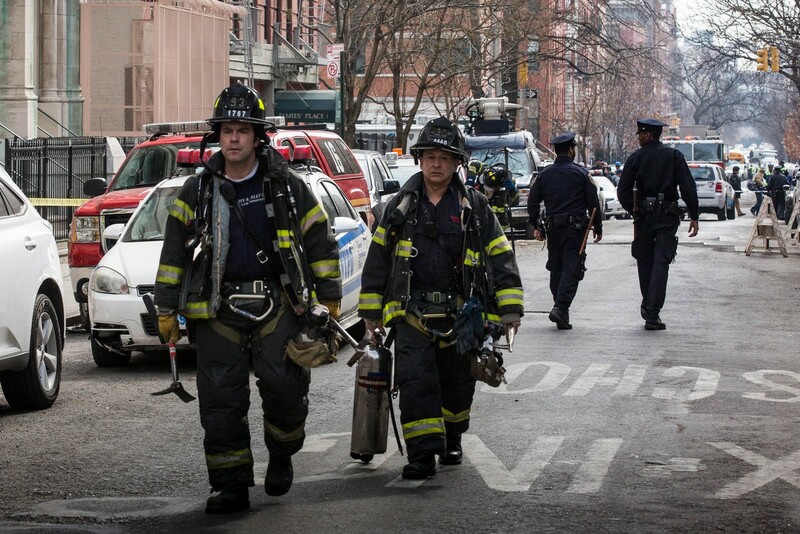 "I saw a lady running with no shoes on. 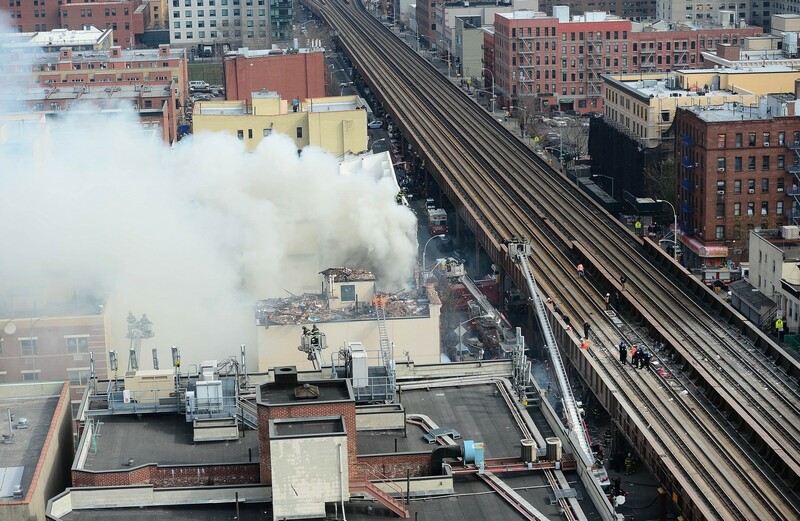 It was crazy. 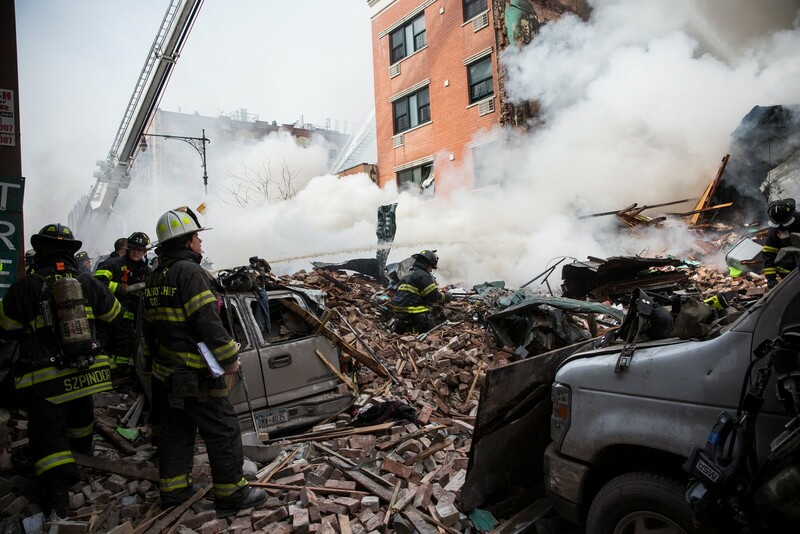 It was like a war zone," another nearby resident told CBS. 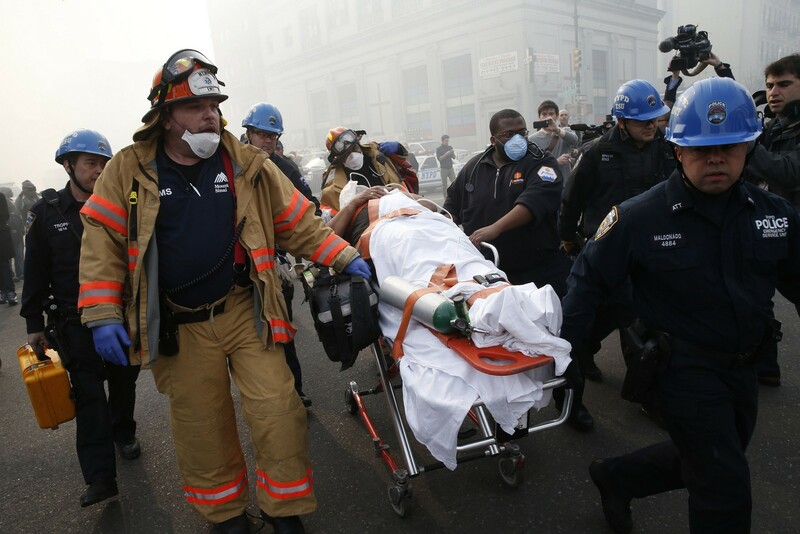 "First of all, I thought it was an earthquake. 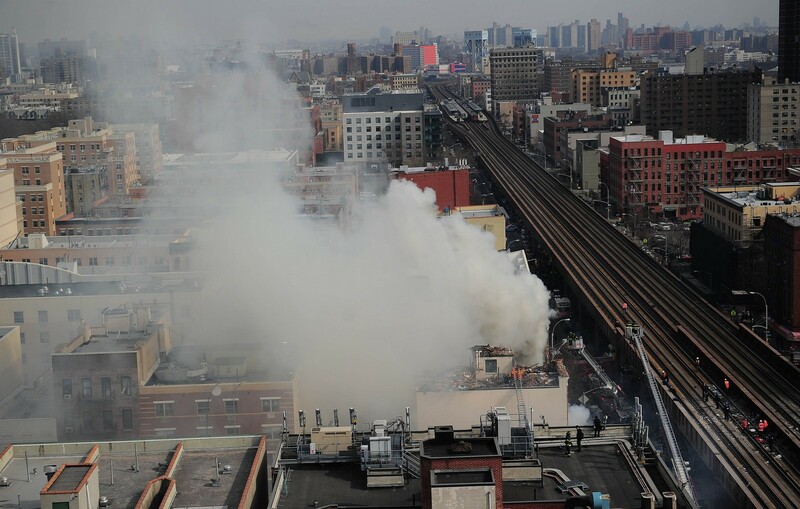 I got calls from my family who felt it too and that was all the way up town. 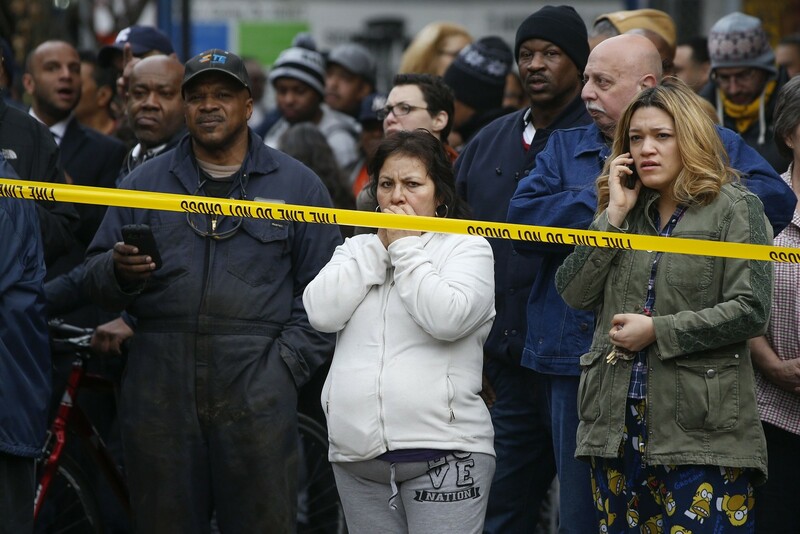 Man, it was crazy," he added. 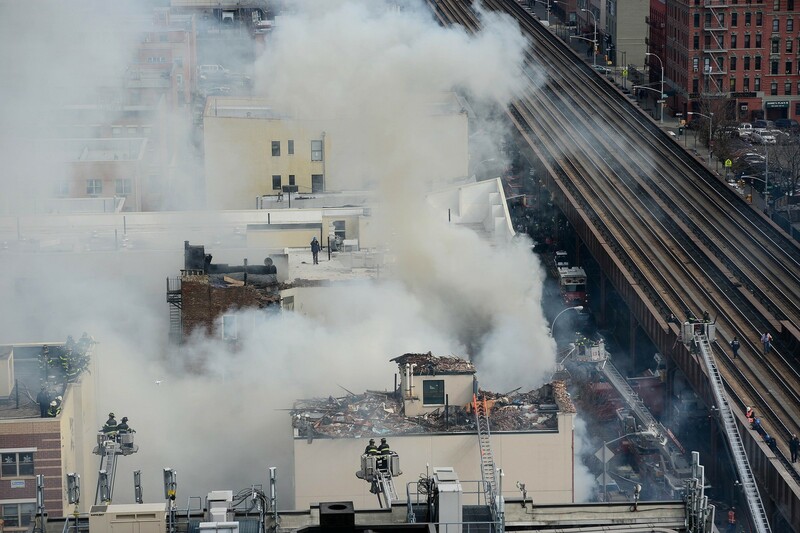 The New York Police Department at first said that one building had exploded and collapsed, then later said it was investigating reports that the collapse may have involved two buildings. 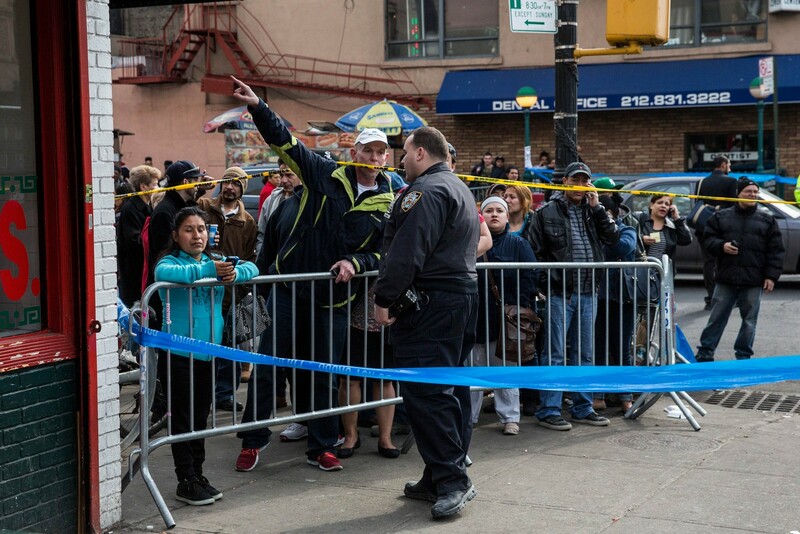 Bystanders two blocks away watch the scene of an explosion and building collapse at Park Avenue and East 116th Street March 12, 2014 in the Harlem section of New York. 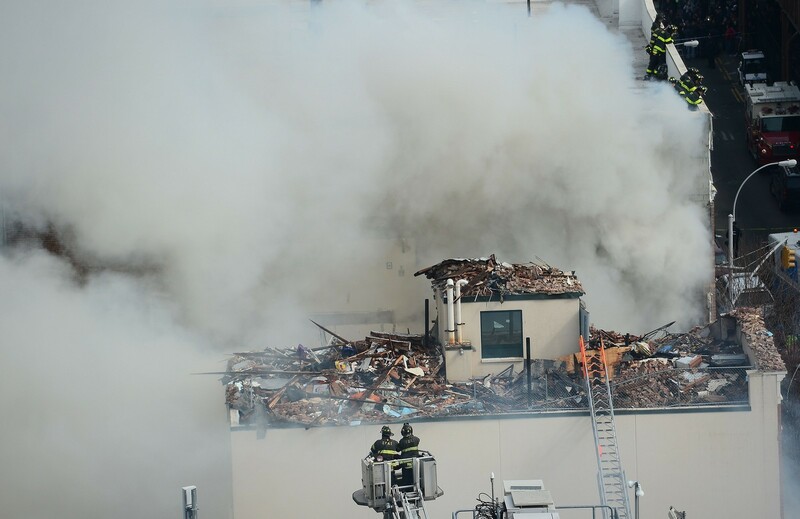 "The cause of the explosion is undetermined at this time," said police spokesman Martin Speechley. 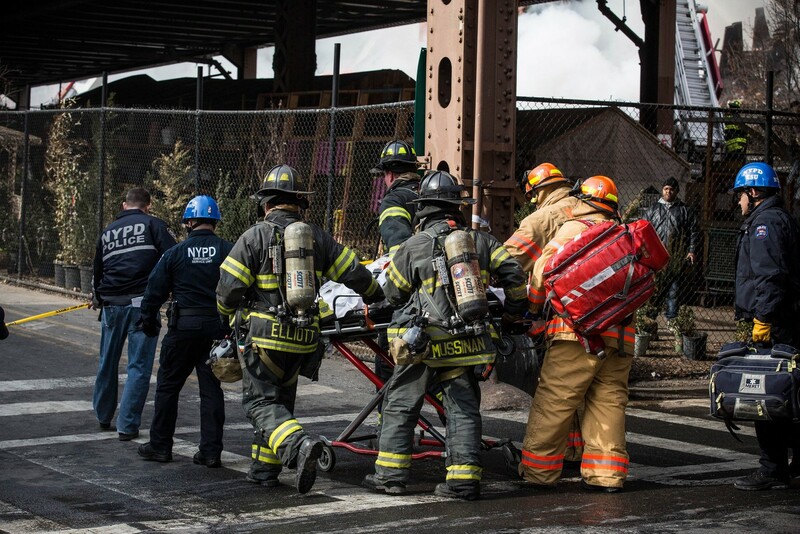 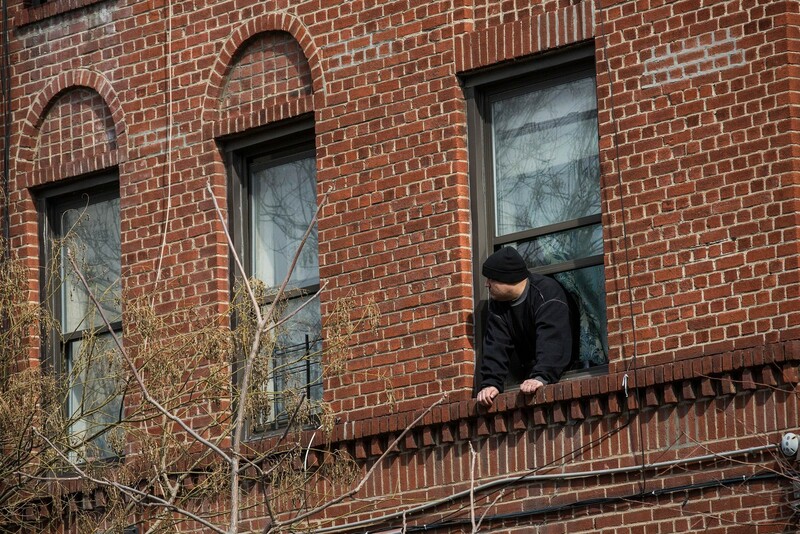 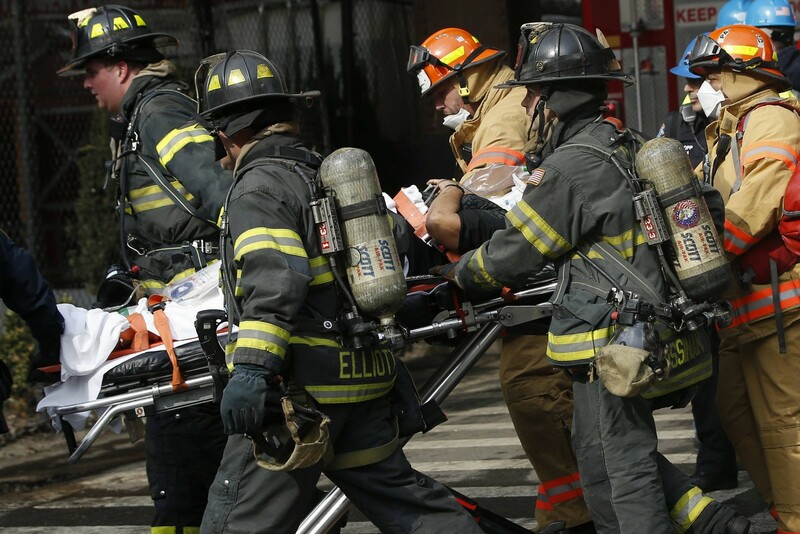 An injured man is assisted near the scene of an explosion and building collapse at Park Avenue and East 116th Street March 12, 2014 in the Harlem section of New York. 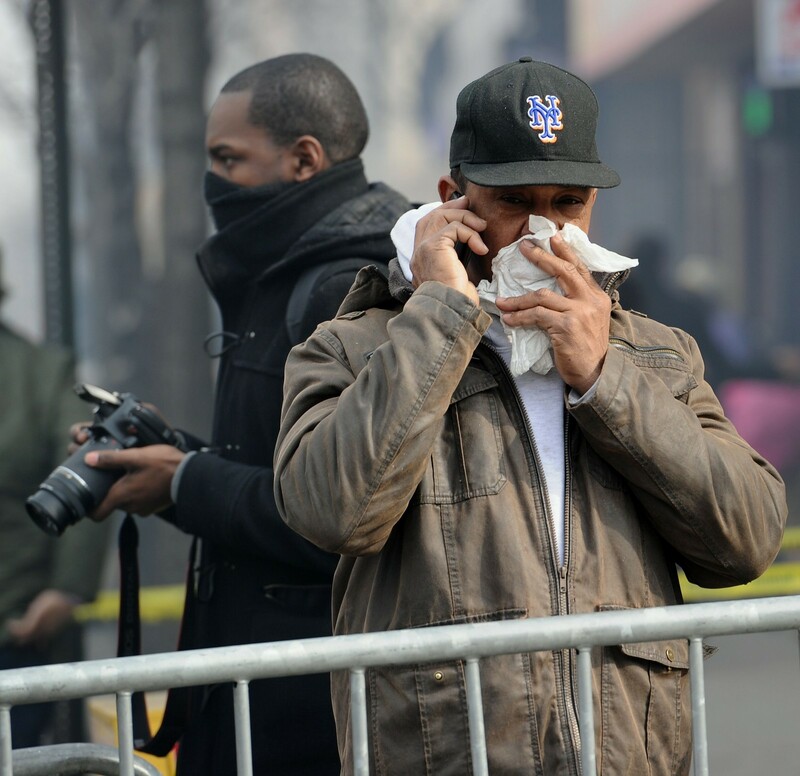 Bystanders cover their faces as they watch firefighters at the scene of an explosion and building collapse at Park Avenue and East 116th Street March 12, 2014 in the Harlem section of New York.